There was a lot of local news in The Havre Plaindealer’s August 4, 1917 issue. The 1917 Chautauqua schedule was the biggest news, with pictures of leading speakers and entertainers filling the front page, as well as a large advertisement with admission fees included and an encouragement to purchase a season ticket to avoid paying single admission tickets which were “nearly three times the cost of season tickets”. In other words, they wanted people there the entire week to see what they had in store for audiences. Considering local weatherman C. W. Ling had announced that July 1917 “breaks hot weather record”, two programs on the Chautauqua schedule might have interested attendees: “Mawson Antarctic Pictures, Sir Douglas Mawson’s wonderful films of the South Pole region” and “Graus’ Alpine Yodlers, Featuring an evening in the Alps. One of the biggest attractions on the Chautauqua platform.” It appears the Chautauqua was living up to its reputation of providing excellent entertainment and educational lectures-good, clean fun for the whole family. It was coming to Havre from August 13-18, so Havreites had plenty of time to plan out a schedule or buy that season ticket and spend a week being entertained and informed. Another large article was a strike by the local plumber’s union. Local master plumbers refused to sign agreements with local union members. Wages were the root cause, with plumbers making $5.20 a day and were asking for $7 a day; however, it seems an agreement was made to pay $6.50 a day to plumbers but that wage was claimed by journeyman plumbers and those not journeyman plumbers were left without. Therefore, the Louis Bay block (Liberty Hotel), Ryan Mercantile block, Gourley block, the new Presbyterian church (on the 700 block of Fourth Avenue), Brainerd-Grady block and other “lesser important” buildings were on hold. Another large article on the Plaindealer’s front page was the announcement that the Assinniboine School was to be open in 1918. The 1917 Legislature had appropriated “for a two-year period $5000 for repairs and $5000 a year for conducting the north Montana school of agriculture and industrial institute at old Fort Assinnboine”. “Bernard Anderberg, a long time resident of Havre, who has for years conducted a tailor shop of his own under the Jim Saloon, committed suicide Wednesday afternoon. His body now lies at the Holland & Son undertaking parlors awaiting the arrival of his son to make funeral arrangements. “Anderberg has been addicted to drink for a long time, but was not under its influence Wednesday and was apparently in his usual health and good spirits in the morning. About noon he entered Boone’s drug store and purchased a four ounce bottle of carbolic acid stating that he wanted it for antiseptic purposes. An hour later he was found dead on a cot in his shop, the empty bottle being on the floor beside the cot. His lips and nouth were badly burmed by the acid and its odor was particularly noticeable. “There was two or three cots in the shop and at 12:20 Joe Duval, a friend, entered the shop and lay down on one of the cots for a nap. Anderberg from his cot spoke to him as he came in saying, “Hello Joe”. Thirty minutes later he was dead and must have taken the poison a few minutes after greeting Duval. The Jim was located on the northwest corner of First Street and Third Avenue. US Bank now occupies the site. 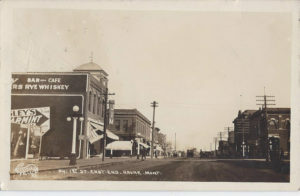 Boone’s Drug Store was located right across First Street, to the south of The Jim. The New You Hair Salon, J. M. Donovan Designs in Fine Jewelry, Ruff Realty and the exit from Havre Beneath the Streets now occupy that site. “On Sunday morning next, a merry party of popular Havre young ladies will start on a two weeks outing along Clear Creek at the Young ranch some 40 miles from the city. The time will be spent in general frolic and a genuine picnic gala season. “Those who will participate in the affair are the Misses Lois Ward, Anna Wilson, Anna Skylstead, Mary Stranahan, Virginia Stringfellow, Eva Chestnut, Marion Broadwater, Catherine Broadwater, Lela Campbell, Esther Anderson, Gladys Matthews, Martha Coleman, Mildred Moon, Charolet Broadwater, Myra Hulfish, Esther Skylstead, Josephine Broadwater. “The party will be chaperoned by the following ladies: Mesdames Wilson, Skylstead, Broadwater, Hulfish and Stringfellow. “The many friends of Mr. and Mrs. Sidney Hirschberg are now enjoying the hot days at the camp on Dillon’s bottom on Beaver creek about 25 miles from Havre where the Hirschberg’s have established a camp which will be maintained for the rest of the summer. “Several tents have been erected and a first class chef has been engaged which insures the best entertainment for their guests. The Jim is to the left of the photograph. US Bank is there today.